Did you know that C-Line introduced the HELLO my name is badge in 1959? It is ideal for small meetings, seminars and conferences. Keep track of visitors to your facility and make them feel welcome. 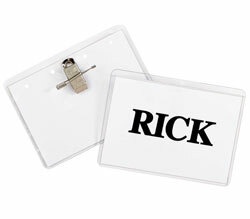 Pressure sensitive Visitor name badges are ideal for small meetings, seminars and conferences. Unique tabbed edge makes it easy to peel off backing paper and apply. Overall badge size: 3 1/2 x 2 1/4. Do not apply to vinyl, leather, suede, corduroy or silk. Blue. Visitor. 100/BX.